The Gothic Revival was an architectural movement that originated in mid eighteenth century England. In the nineteenth century, increasingly serious and learned neo-Gothic styles sought to revive medieval forms, distinct from the classical styles prevalent at the time. The movement had significant influence throughout the United Kingdom as well as other areas of Europe and North America, and perhaps more Gothic architecture was built during the nineteenth and twentieth centuries than in the medieval times that inspired it. Gothic architecture aims to create an experience of the sublime or the sense of transcendent greatness by dwarfing the mortal human who enters a structure that is "prodigiously vast in appearance" due to the way that "space, light, structure and the plastic effects of the masonry are organized to produce a visionary scale." The Gothic Revival was paralleled and supported by an underlying cultural current of medievalism, or fascination with works and artifacts from the medieval period. Works of literature, porcelain, and interior decoration at times followed and other times preceded and even drove the Gothic Revival in architecture. 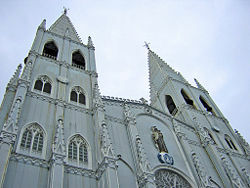 San Sebastian Church in Manila, Philippines made entirely of steel. Engineering designs were from Gustave Eiffel. The University of Pittsburgh's Cathedral of Learning in Pittsburgh, Pennsylvania. Gothic architecture is generally considered to have begun at the Abbey of Saint-Denis, Paris, in 1140, and ended with a last great flourish at Henry VIIs Chapel at Westminster in the early sixteenth century. On a smaller scale, however, Gothic architecture did not die out completely in 1520. Instead, it lingered in on-going cathedral-building projects and the construction of churches in increasingly isolated rural districts of England, France, Spain, Germany, and the Polish Commonwealth. In Bologna, in 1646, the Baroque architect Carlo Rainaldi constructed Gothic vaults (completed 1658) for the Basilica of San Petronio which had been under construction since 1390; there, the Gothic context of the structure overrode considerations of the current architectural mode. Similarly, Gothic architecture survived in an urban setting into the later seventeenth century, as shown in Oxford and Cambridge, where some additions and repairs to Gothic buildings were apparently considered to be more in keeping with the style of the original structures than contemporary Baroque. 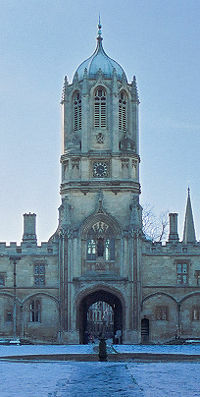 Sir Christopher Wren's Tom Tower for Christ Church College, Oxford University, and, later, Nicholas Hawksmoor's west towers of Westminster Abbey, blur the boundaries between what is called "Gothic survival" and the Gothic revival. In English literature, the architectural Gothic Revival and classical Romanticism gave rise to the Gothic novel genre, beginning with Castle of Otranto (1764) by Horace Walpole, 4th Earl of Orford, and inspired a nineteenth century genre of medieval poetry that stems from the pseudo-bardic poetry of "Ossian." Poems like "Idylls of the King" by Alfred Lord Tennyson recast specifically modern themes in medieval settings of Arthurian romance. In Germany, the Gothic Revival also had a grounding in literary fashions. In the mid eighteenth century, with the rise of Romanticism, an increased interest and awareness of the Middle Ages among some influential connoisseurs created a more appreciative approach to selected medieval arts, beginning with church architecture, the tomb monuments of royal and noble personages, stained glass, and late Gothic illuminated manuscripts. The "Gothick" details of Walpole's Twickenham villa, "Strawberry Hill," appealed to the rococo tastes of the time, and by the 1770s, thoroughly neoclassical architects such as Robert Adam and James Wyatt were prepared to provide Gothic details in drawing-rooms, libraries, and chapels. A prime example is Wyatt's romantic vision of a Gothic abbey as substantiated in Fonthill Abbey in Wiltshire. Inveraray Castle, constructed from 1746 with design input from William Adam, displays the early revival of Gothic features in Scotland. The "Gothick" style was an architectural manifestation of the artificial "picturesque" seen elsewhere in the arts: these ornamental temples and summer-houses ignored the structural logic of true Gothic buildings and were effectively Palladian buildings with pointed arches. The eccentric landscape designer Batty Langley even attempted to "improve" Gothic forms by giving them classical proportions. A younger generation, which took Gothic architecture more seriously, provided the readership for J. Britten's series of Cathedral Antiquities, which began appearing in 1814. In 1817, Thomas Rickman wrote an Attempt… to name and define the sequence of Gothic styles in English ecclesiastical architecture, "a text-book for the architectural student." Its long title is descriptive: Attempt to discriminate the styles of English architecture from the Conquest to the Reformation; preceded by a sketch of the Grecian and Roman orders, with notices of nearly five hundred English buildings. The categories he used were Norman, Early English, Decorated, and Perpendicular. It went through numerous editions and was still being republished in 1881. French neo-Gothic had its roots in a minor aspect of Anglomanie, starting in the late 1780s. In 1816, when French scholar Alexandre de Laborde said "Gothic architecture has beauties of its own," the idea was novel to most French readers. Starting in 1828, Alexandre Brogniart, the director of the Sèvres porcelain manufactory, produced fired enamel paintings on large panes of plate glass, for Louis-Philippe's royal chapel at Dreux. It would be hard to find in France a large, significant commission in Gothic taste that preceded this one, save for some Gothic features in a handful of jardins à l'anglaise. The French Gothic revival was set on sounder intellectual footings by a pioneer, Arcisse de Caumont, who founded the Societé des Antiquaires de Normandy at a time when antiquaire still meant a connoisseur of antiquities, and who published his great work on Norman architecture in 1830 (Summerson 1948). The following year Victor Hugo's Nôtre Dame de Paris appeared, in which the great Gothic cathedral of Paris was at once a setting and a protagonist in a hugely popular work of fiction. Hugo had intended his book to awaken a concern for the surviving Gothic architecture, but instead in initiated a craze for the neo-Gothic in contemporary life. In the same year that Nôtre-Dame de Paris appeared, the new French monarchy established a post of Inspector-General of Ancient Monuments, filled in 1833 by Prosper Merimée, who became the secretary of a new Commission des Monuments Historiques in 1837. This was the Commission that instructed Eugène Viollet-le-Duc to report on the condition of the abbey of Vézelay in 1840. Following this, Viollet le Duc set out to restore most of the symbolic buildings in France—Notre Dame de Paris, Vézelay, Carcassone, Roquetaillade castle, Mont Saint-Michel, Pierrefonds, Palais des Papes à Avignon, etc. 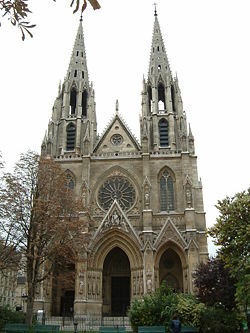 France’s first prominent neo-Gothic church was the Basilica of Sainte-Clothilde (the choice of the canonized wife of Clovis was especially significant for the Bourbons), Paris, begun in September 1846, and consecrated November 30, 1857. The architect chosen, François-Christian Gau (1790–1853), was, significantly, of German extraction. The design was significantly modified by Gau's assistant, Théodore Ballu, in the later stages, to produce the pair of flêches (spires) that crown the west end. Meanwhile, in Germany, interest in the Cologne Cathedral, which had begun construction in 1248 and was still unfinished at the time of the revival, began to reemerge. The 1820s Romantic movement brought back interest, and work began once more in 1824, significantly marking a German return of Gothic architecture. Because of Romantic nationalism in the early nineteenth century, the Germans, French, and English all claimed the original Gothic architecture of the twelfth century as originating in their own country. The English boldly coined the term "Early English" for Gothic, a term that implied Gothic architecture was an English creation. In his 1832 edition of Notre Dame de Paris Victor Hugo said "Let us inspire in the nation, if it is possible, love for the national architecture," implying that Gothic was France's national heritage. In Germany, with the completion of Cologne Cathedral in the 1880s, at the time the world's tallest building, the cathedral was seen as the height of Gothic architecture. In Florence, the Duomo's temporary façade erected for the Medici-House of Lorraine nuptials in 1588–1589, was dismantled, and the west end of the cathedral stood bare until 1864, when a competition was held to design a new facade suitable to Arnolfo di Cambio's structure and the fine campanile next to it. This competition was won by Emilio De Fabris, and work on his neo-gothic polychrome design and panels of mosaic was begun in 1876 and completed in 1887. In the late 1820s, A.W.N. Pugin, still a teenager, was working for two highly visible employers, providing Gothic detailing for luxury goods. 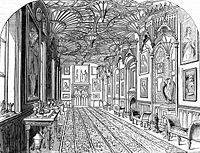 For the Royal furniture makers Morel and Seddon he provided designs for redecorations for the elderly George IV at Windsor Castle in a Gothic taste suited to the setting. For the royal silversmiths Rundell Bridge and Co., Pugin provided designs for silver from 1828, using the fourteenth century Anglo-French Gothic vocabulary that he would continue to favor later in designs for the new Palace of Westminster. Between 1821 and 1838, Pugin and his father published a series of volumes of architectural drawings, the first two entitled, Specimens of Gothic Architecture, and the following three, Examples of Gothic Architecture. These were to remain both in print and the standard references for Gothic revivalists for at least the next century. In Contrasts (1836), Pugin expressed his admiration not only for mediæval art but the whole mediæval ethos, claiming that Gothic architecture was the product of a purer society. In The True Principles of Pointed or Christian Architecture (1841), he suggested that modern craftsmen seeking to emulate the style of medieval workmanship should also reproduce its methods. Pugin believed Gothic was true Christian architecture, and even claimed, "The pointed arch was produced by the Catholic faith." 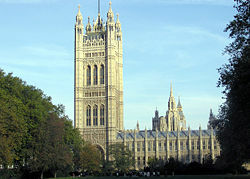 Pugin's most famous building is The Houses of Parliament in London, which he designed in two campaigns, 1836–1837 and again in 1844 and 1852, with the classicist Charles Barry as his co-architect. Pugin provided the external decoration and the interiors, while Barry designed the symmetrical layout of the building, causing Pugin to remark, "All Grecian, Sir; Tudor details on a classic body." John Ruskin supplemented Pugin's ideas in his two hugely influential theoretical works, The Seven Lamps of Architecture (1849) and The Stones of Venice (1853). Finding his architectural ideal in Venice, Ruskin proposed that Gothic buildings excelled above all other architecture because of the "sacrifice" of the stone-carvers in intricately decorating every stone. By declaring the Doge's Palace to be "the central building of the world," Ruskin argued the case for Gothic government buildings as Pugin had done for churches, though only in theory. 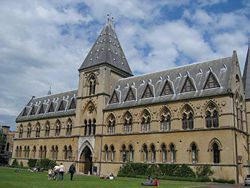 When his ideas were put into practice, Ruskin despised the spate of public buildings built with references to the Ducal Palace, including the University Museum in Oxford. In England, the Church of England was undergoing a revival of Anglo-Catholic and ritualist ideology in the form of the Oxford Movement, and it became desirable to build large numbers of new churches to cater to the growing population. This found ready exponents in the universities, where the ecclesiological movement was forming. Its proponents believed that Gothic was the only style appropriate for a parish church, and favored a particular era of Gothic architecture—the "decorated." The Ecclesiologist, the publication of the Cambridge Camden Society, was so savagely critical of new church buildings that were below its exacting standards that a style called the "archaeological Gothic" emerged, producing some of the most convincingly mediæval buildings of the Gothic revival. However, not every architect or client was swept away by this tide. Although Gothic Revival succeeded in becoming an increasingly familiar style of architecture, the attempt to associate it with the notion of high church superiority, as advocated by Pugin and the ecclesiological movement, was anathema to those with ecumenical or nonconformist principles. They looked to adopt it solely for its aesthetic romantic qualities, to combine it with other styles, or look to northern Europe for Gothic of a more plain appearance; or in some instances all three of these, as at the ecumenical Abney Park Cemetery for whom the architect William Hosking FSA was engaged. If France had not been quite as early on the neo-Gothic scene, she produced a giant of the revival in Eugène Viollet-le-Duc. A powerful and influential theorist, Viollet-le-Duc was a leading architect whose genius lay in restoration. 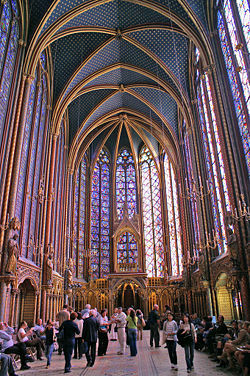 He believed in restoring buildings to a state of completion that they would not have known even when they were first built, and he followed this principle in his restorations of the walled city of Carcassonne and Notre-Dame and Sainte Chapelle in Paris. In this respect he differed from his English counterpart Ruskin as he often replaced the work of medieval stonemasons. His rational approach to Gothic was in stark contrast to the revival’s romanticist origins, and is considered by some to have been a prelude to the structural honesty demanded by Modernism. Throughout his career Viollet-le-Duc remained in a quandary as to whether iron and masonry should be combined in a building. Iron had in fact been used in Gothic buildings since the earliest days of the revival. It was only with Ruskin and the archaeological Gothic's demand for structural truth that iron, whether it was visible or not, was deemed improper for a Gothic building. This argument began to collapse in the mid-19th century as great prefabricated structures such as the glass and iron Crystal Palace and the glazed courtyard of the Oxford University Museum were erected, which appeared to embody Gothic principles through iron. Between 1863 and 1872 Viollet-le-Duc published his Entretiens sur l’architecture, a set of daring designs for buildings that combined iron and masonry. Though these projects were never realized, they influenced several generations of designers and architects, notably Antoni Gaudi in Spain and, in England, Benjamin Bucknall, Viollet's foremost English follower and translator, whose masterpiece was Woodchester Mansion. 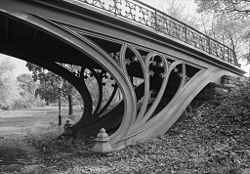 The flexibility and strength of cast iron freed neo-Gothic designers to create new structural gothic forms impossible in stone, as in Calvert Vaux's cast-iron bridge in Central Park, New York (1860s). Vaux enlists openwork forms derived from Gothic blind-arcading and window tracery to express the spring and support of the arching bridge, in flexing forms that presage Art Nouveau. The revived Gothic style was not limited to architecture. Whimsical Gothic detailing in English furniture is traceable as far back at Lady Pomfret's house in Arlington Street, London (1740s), and Gothic fretwork in chairbacks and glazing patterns of bookcases is a familiar feature of Chippendale's Director (1754, 1762), where, for example the three-part bookcase employs gothic details with Rococo profusion, on a symmetrical form. Sir Walter Scott's Abbotsford exemplifies in its furnishings the "Regency Gothic." By the mid nineteenth century Gothic traceries and niches could be inexpensively re-created in wallpaper, and Gothic blind arcading could decorate a ceramic pitcher. The illustrated catalog for the Great Exhibition of 1851 is replete with Gothic detail, from lacemaking and carpet designs to heavy machinery. 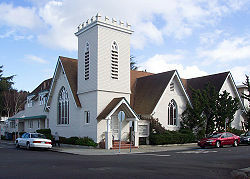 Carpenter gothic Unitarian Universalists of San Mateo, California (built 1905) showing gothic arches, steep gables, and a tower. The tower includes examples of abat-sons. Carpenter Gothic houses and small churches became common in North America in the late nineteenth century. These structures adapted Gothic elements such as pointed arches, steep gables, and towers to traditional American light-frame construction. The invention of the scroll saw and mass-produced wood moldings allowed a few of these structures to mimic the florid fenestration of the high Gothic. But in most cases, Carpenter Gothic buildings were relatively unadorned, retaining only the basic elements of pointed-arch windows and steep gables. Arguably, the most famous example of Carpenter Gothic is not even a real building. It appears in the background of the painting American Gothic by Grant Wood. 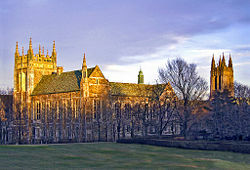 Collegiate Gothic buildings of Boston College. At the turn of the twentieth century, technological developments such as the light bulb, the elevator, and steel framing caused many to see architecture that used load-bearing masonry as obsolete. Steel framing supplanted the non-ornamental functions of rib vaults and flying buttresses. Some architects used Neo-Gothic tracery as applied ornament to an iron skeleton underneath, for example in Cass Gilbert's 1907 Woolworth Building skyscraper in New York and Raymond Hood's 1922 Tribune Tower in Chicago. But over the first half of the century, Neo-Gothic became supplanted by Modernism. Some in the Modern Movement saw the Gothic tradition of architectural form entirely in terms of the "honest expression" of the technology of the day, and saw themselves as the rightful heir to this tradition, with their rectangular frames and exposed iron girders. 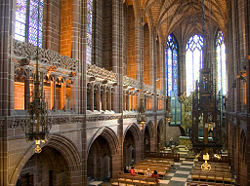 In spite of this, the Gothic revival continued to exert its influence, simply because many of its more massive projects were still being built well into the second half of the twentieth century, such as Giles Gilbert Scott's Liverpool Cathedral. In the United States, James Gamble Rodgers' reconstruction of the campus of Yale University and Charles Donagh Maginnis's early buildings at Boston College helped establish the prevalence of Collegiate Gothic architecture on American university campuses. Charles Klauder's Gothic revival skyscraper on the University of Pittsburgh's campus, the Cathedral of Learning, for example, used very Gothic stylings both inside and out, while using modern technologies to make the building taller. Ralph Adams Cram became a leading force in American Gothic, with his most ambitious project the Cathedral of Saint John the Divine in New York (claimed to be the largest Cathedral in the world), as well as Collegiate Gothic buildings at Princeton University. Cram said, "the style hewn out and perfected by our ancestors [has] become ours by uncontested inheritance." In addition to Princeton University, Lehigh University and Boston College, some of the buildings on West Chester University's campus are also built in the Collegiate Gothic style. Also, Atlanta's historic Oglethorpe University continues to build in the Collegiate Gothic style to this day. Though the number of new Gothic revival buildings declined sharply after the 1930s, they continue to be built. The cathedral of Bury St. Edmunds was constructed between the late 1950s and 2005. In 2002, Demetri Porphyrios was commissioned to design a neo-Gothic residential college at Princeton University to be known as Whitman College. Porphyrios has won several commissions after votes by student bodies, not university design committees, suggesting that neo-Gothic architecture may be more popular among the general public than among those in the architectural profession. Vaucluse House Sydney Regency Gothic. Sydney Conservatorium of Music, the old Government stable block. Sydney University, the main building, commenced 1850s, extended twentieth century. The central spire of the Notre-Dame Cathedral, Paris. Castello di Pollenzo, Brà (near Cuneo), Piedmont. ↑ Robert Branner. Gothic Architecture. (New York: George Braziller, 1961), 10. ↑ Michael J. Lewis. The Politics of the German Gothic Revival: August Reichensperger. ↑ Victorian Web, Augustus Welby Northmore Pugin. Retrieved September 14, 2007. ↑ Gabion, Return of the Goths: the last Anglican cathedral is nearly finished. And built to last 1,000 years. hughpearman.com. Retrieved September 14, 2007. Branner, Robert. Gothic Architecture (Great Ages of World). New York: George Braziller, 1965. Lewis, Michael J. The Politics of the German Gothic Revival: August Reichensperger. Robson-Scot, W D. The Literary Background of the Gothic Revival in Germany: A Chapter in the History Of Taste. London: Clarendon Press, 1965. Summerson, Sir John. 1948. "Viollet-le-Duc and the Rational Point of View" collected in Heavenly Mansions and Other Essays on Architecture. This page was last modified on 27 June 2017, at 16:16.